The dark secret isn’t about the thousands of British-Caribbean subjects of the British Empire, naturalised by the British Nationality Act in 1948, that made the cross-Atlantic journey to Blighty, but about the famed boat on which the first 492 citizens made their faithful journey that same year. The HMT (that’s Her Majesty’s Tug) Empire Windrush, to give the vessel its full name, was used by the Royal Navy mainly as a troopship from 1945 to 1954. En route from Australia to England via the Atlantic, the ship docked in Kingston, Jamaica, to pick up servicemen who were on leave. The ship was far from full, so an opportunistic advertisement was placed in a Jamaican newspaper offering voyages to Britain for those who, after the British Nationality Act, were given the status of Citizenship of the United Kingdom and Colonies (CUKC status) and wanted to come to Britain for work. When, in 1946, the Canadian Parliament passed the Canadian Citizenship Act, which attempted to establish a Canadian citizenship separate from Britain, a Commonwealth conference was called in London the next year, eventually resulting in the Labour government’s naturalisation of the Empire’s colonial subjects. Though the Act conferred citizenship to all subjects without exception, there was no doubt that policymakers in Whitehall had already conjured up images of burly Canadian lumberjacks and wealthy South African diamond traders valiantly sailing to the rescue of their motherland, filling vacancies and propelling Britain out of her post-war slump. What they had not foreseen was that many ordinary Jamaicans, Pakistanis and Indians also had both the initiative and the money to make the voyage. Neither had they anticipated that British employers like London Transport would begin actively reaching out to those with CUKC status. In fact, one could argue, as John O’Farrell does, that the diversification of Britain ‘did not happen because of any planned government policy; it happened when no one was looking’. Once they began arriving, there was no going back, and British politicians and civil society had to pretend, in retrospect, to have been in favour of immigration so as not to appear racist. Now, for the dark secret. Though HMT Empire Windrush belonged to the Royal Navy in 1948, the ship was not built in the shipyards of Southampton or Liverpool. In fact, the ship was built by Blohm & Voss in Hamburg between 1924 and 1931 for Hamburg Süd (Hamburg South American Steam Shipping Company). Originally named MV Monte Rosa, it was designed to serve as a passenger ship ferrying German immigrants to South America. In fact, the Company believed the trade to be so lucrative, it had ordered 5 other identical Monte-class passenger ships to be built. The MV Monte Rosa was the last to be completed. Though initially successful in facilitating settler colonialism and the spread of what one man would later, mistakenly, call the ‘Aryan’ race, the envisioned immigrant trade never materialised, and Hamburg Süd found a more benign task for the humble tug (worry not, our ship will soon be back in the service of German nationalism). By offering cruises, which had previously been the preserve of the rich, at modest prices, Hamburg Süd was able to profitably cater to a large new clientele, and MV Monte Rosa had a new lease of life. That is, until 1933. After the explosive post-depressionary rise of the Nazi party, and its systematic seizure and subordination of Weimar Germany’s institutions, Hitler proceeded to implement one of the most effective campaigns of propaganda mass indoctrination in human history. ‘Blood & Soil’, ‘Lebensraum’, ‘Ubermensch’. Depraved ideas were relentlessly drilled into the minds of Germans. 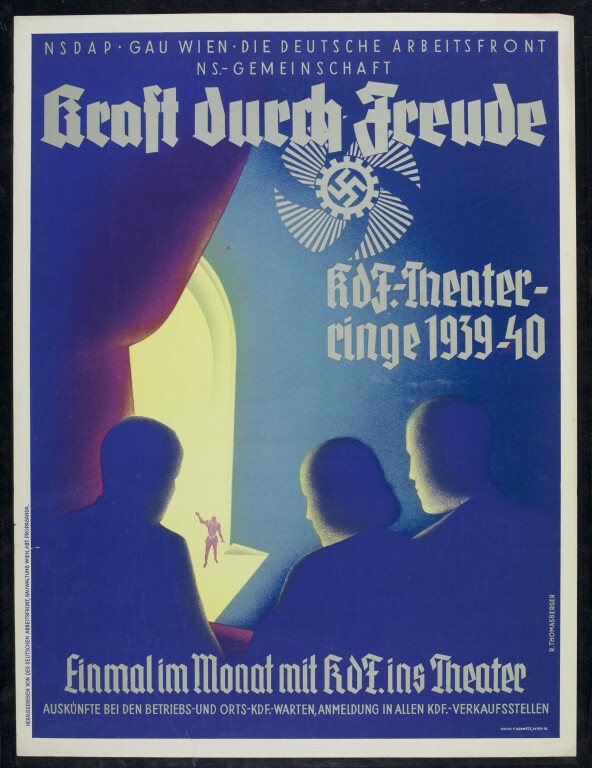 The one we’re interested in was called ‘Kraft durch Freude‘ (Strength Through Joy), a state programme which provided leisure and cheap holidays. MV Monte Rosa, was, of course, used to ferry holidaymakers to and from Germany. At the start of World War II, MV Monte Rosa was allocated for military use. She was used as a troopship in the German invasion of Norway in April 1940, as an accommodation ship for the Battleship Tirpitz during its raids on allied convoys headed to Russia, and, occasionally, as a hospital ship. She was even used as one of several ships used for the deportation of Norwegian Jewish people, carrying a total of 46 people from Norway to Denmark, including the Polish-Norwegian businessman and humanitarian Moritz Rabinowitz. Of the 46 deportees carried on Monte Rosa, all but two died in Auschwitz concentration camp. In May 1945, she was captured by British forces at Kiel and taken as a prize of war. By this time, MV Monte Rosa, now a miserly 14 years of age, was the last surviving sibling of the 6 Monte-class ships ordered by Hamburg Süd all those years ago. She was bestowed with the name we know her by today in January of 1847, and a year later HMT Empire Windrush, a former Nazi vessel, would embark on the journey that immortalised it as a symbol of the new ‘Britishness’. The story of HMT Empire Windrush is neatly circular. A ship that spent its whole life facilitating German ethno-nationalism by way of settler colonialism, Nazi propaganda, or even as a support ship in the Kriegsmarine. She was part of the German blitzkrieg that overwhelmed British troops in Norway in 1940. One wonders if any British-Carribean soldiers caught a fleeting glimpse of her. Little did they know what she would one day become. The HMT Empire Windrush transported Norwegian Jews to their deaths at Auschwitz in what was, and still is, the most devastating genocide in human history. There is, then, a kernel of justice in the role she played in shattering any notion of a British ‘ethno-state’ and instigating the multi-cultural revolution. I would love to claim that the transformation, even redemption, of the HMT Empire Windrush mirrors that of British society. Alas, to this day, the descendents of the Windrush migrants still struggle with an institutional racism which still haunts British society. They bore the burdens of war just as much, if not more than, any Englishman. They came to help rebuild Britain after the devastation of World War Two, invited by the UK government to lay roads, drive buses, clean hospitals and nurse the sick. They enriched our culture, giving us music, cuisine and arts. What have they recieved in return? Squalid living conditions, institutional racism, constant attacks, police brutality and social ostracization. Even now, the Home Office’s efforts to cut immigration numbers have led to the scandalous deportation of Windrush immigrants and their descendants. Until British society, institutions and all, can accept the fact that black people have just as much a right to be British citizens as anyone else, and that ‘Britishness’ is in essence a civic, rather than an ethnic, identity, its transformation from MV Monte Rosa to HMT Empire Windrush will remain incomplete. Previous The ‘Age of Romanticism’: Fact of Fiction? Next Was Socialism Really a ‘Working Class’ Movement? Fascinating! Excellent. May I share? Here are more thoughts on the Windrush issue – this time from a “second-year undergraduate scholar at New College, Oxford studying History and Economics…born in West London to Iraqi refugees.” This post focuses on the ship itself, and its “blissfully circular” history. Thank you for sharing. I certainly just learned quite a bit. Thank you also for your interest in my blog and I look forward to following yours. This post’s title made me do a double take and I got a history lesson as well. You see, my blog is called Wind Rush but I never knew about this tug boat. I got my title from a street name near my home. Thanks for informing me about the Windrush and this interesting time in history. Thanks for following my blog. I love the little bits of history that never seem to make it into the history books. Thanks for this bit. Fascinating history, and very well written! It’s interesting what you find when you turn over stones, isn’t it!